Juice Beauty Green Apple Firming Body Moisturizer comes in at 3.5 out of 5 stars because I ended up liking it. There are quite a few things that I really like about this cellulite cream. I like fuss-free products and this is definitely one of them. It’s super easy to apply and goes on like your typical body moisturizer. It comes in a convenient (sanitary) squeeze tube, unlike the icky open jar methods that gross me out. Just apply a generous amount all over your body and it dries in just a few minutes. I’m a huge fan of this crisp, delicious smelling green apple scent. I actually look forward to putting this firming moisturizer on, as opposed to a great deal of cellulite products that I totally loathe applying. This product is affordable, doesn’t test on animals, and uses organic ingredients. These are all very important factors to me. They also ditch all the harmful chemicals and additives. Double points! I’m really happy with the results, too. My skin felt super supple and hydrated. After using it for a while, I definitely saw some improvement with my skin tone and my problem areas looked and felt a bit firmer. I love products that kill two birds with one stone and this acts as a body moisturizer and firming cream all in one. I definitely think this is an above average product and am happy with my purchase. Juice Beauty Green Apple Firming Body Moisturizer comes out of the tube as a white cream. It has a rich, creamy texture that feels super luxurious on the skin. Application is easy peasy lemon (or apple in this case) squeezy! It comes in a squeezy tube and you just squeeze a generous amount into your hand and apply an even layer over your entire body. It pretty much goes on like any other body moisturizer or cream. And unlike other thick creams, this one isn’t pasty or leaves your skin looking like a ghost. Just rub it in with circular motions and you’re good to go! It absorbs into the skin super nicely. I’m so surprised with the drying time. The moisturizer dries in 2 – 3 minutes. I slathered quite a bit on each time and sometimes rich creams just sit on your skin but this one dried amazingly. It didn’t really leave any type of residue either or feel greasy. You can definitely tell you put something on your skin but it felt hydrating more than anything. The smell is one of my favorite things about this moisturizer. It has a delicious, crisp, green apple scent to it. 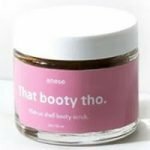 I feel like the majority of cellulite creams have very off-putting smells so I was pleasantly surprised with this one. After applying, I’d say the smell lasts for about 45 minutes to an hour or so. I honestly wish it lasted longer because it smells so good. It’s super yummy and has a clean, light, refreshing scent to it. I noticed short term results literally after the first use. My skin is super soft and feels so supple. This firming body moisturizer did wonders for my dry areas. It’s very hydrating and overall, my skin just feels so healthy after using it. I’m really happy with my long term results! My problem areas that have the most cellulite (bum and back of my legs) look and feel firmer and more smoothed out. My skin looks a bit brighter and skin tone is evened out more. It’s not a miracle worker but I definitely noticed some positive results! This firming body moisturizing has over 20 ingredients in it and a great deal are very beneficial! Juice Beauty says this product is effective for women in their 20s and up with uneven skin tone and texture, dark spots, and discoloration. It helps replenish and deeply hydrate with organic shea butter, jojoba seed oil, and sunflower seed oil. Vitamin C from organic green apples provides a brightening effect on the skin. This formula uses peptides, which are believed to help smooth the appearance of fine lines and create firmer looking skin. It also contains rich botanicals of primrose, borage, and linseed that are meant to nourish and hydrate the skin. I really like this brand because it’s cruelty free and it’s formulated without parabens, petroleum, propylene or butylene glycol, sodium lauryl sulfates, pesticides, phthalates, artificial dyes or synthetic fragrances. They also use an abundance of organic ingredients, which is super important to me and many of you, as well. On the Juice Beauty website, it costs $20.00 for an 8 fluid ounce bottle. So it works out to be $2.50 per ounce of product. You do have to pay for shipping but they give you a few options. It’s $6 for USPS Priority Mail (3-5 days) and $8 for USPS Priority Mail (signature required). And if for some reason you need your Juice Beauty STAT, they have UPS 2 Day Air for $19 and UPS Next Day Air for $22. BUT if you spend $30+, you get free US shipping. If you end up really liking it, they have an auto-replenish subscription for automatic delivery every 1-4 months (you choose) for $19 (save 5%) + free shipping. And you can cancel or modify at any time. Last tip, if you sign up for their newsletter, they’ll give you 15% off your order. So all in all, it’s super affordable! I’m very happy with the price and think it’s a great value. The bottle lasts awhile and as a little perk you get to choose 2 free samples. I’m a sucker for anything FREE! And samples are always cute and fun. I got the Flawless Serum Foundation Trio in Cream, Sand and Medium Tan and the Mini GREEN APPLE Cleansing Bar. And you can only pick the STEM CELLULAR Anti-Wrinkle Moisturizer or Small Foundation Brush. Juice Beauty has a 30-day, 100% money back guarantee. If for any reason you’re unhappy with your purchase, they will issue you a refund to your credit card or exchange the unsatisfactory product with another one if it’s returned within 30 days. To do so, complete the “Return Form” on your invoice or if you don’t have it then email customerservice@juicebeauty.com to get your order number. Keep in mind that Juice Beauty doesn’t pay for return shipping costs. And they only accept back Juice Beauty products that were purchased directly through JuiceBeauty.com. They can’t accept products that were purchased from a third-party retailer. I’m super happy that they give you a guarantee, though. I strongly believe that all companies should stand behind the quality of their products and offer their customers with some type of guarantee. To buy Juice Beauty Green Apple Firming Body Moisturizer, click here.